Supplier & Manufacturer of Automatic Capsule Loader. Our product range also comprises of Auto Polishing Machine, Automatic Capsule Filling Machine and Semi-Automatic Capsule Filling Machine. 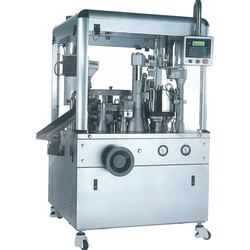 Automatic Capsule Loader Filling Machine is used in combination with manually operated capsule filling machine. The capsule is loaded in capsule tray in cap up-body down position automatically (Instead of filling loaded tray manually in filling machine). CCL designed to serve the need of medium and large-scale Pharmaceutical companies. It is easy to operate & maintenance free.